There are many artists with colorful and tragic life stories, which either aided or were detrimental to their creative success. Flemish Baroque painter Adriaen Brouwer, who was born in 1605 in Oudenaarde, Belgium was an alcoholic 17th century Dutch master. He was one of those painters who derived raw inspiration from his immediate environment, as he loved to live in pub houses, and eating stews. From the little known of his short life, it was inferred that he was a cynic philosopher and a reveler. He hated social decencies and hypocrisies and loved to show them up, all the while creating some of the finest genre paintings in that era. He could have been a pupil of another Flemish Old Master, Frans Hals. Brouwer was quite advanced as an artist and was already considered a master at the age of 21, and was registered as such in the Guild of Saint Luke in Antwerp in 1631. He was also active in poetry and acting on stage. After studying in Haarlem, he settled in Antwerp. His works were often small but very detailed, with common themes such as foolishness, drunkenness and debauchery, which was his way of exploring people’s emotions, responses and expressions to fear and pain, and when their senses were triggered. 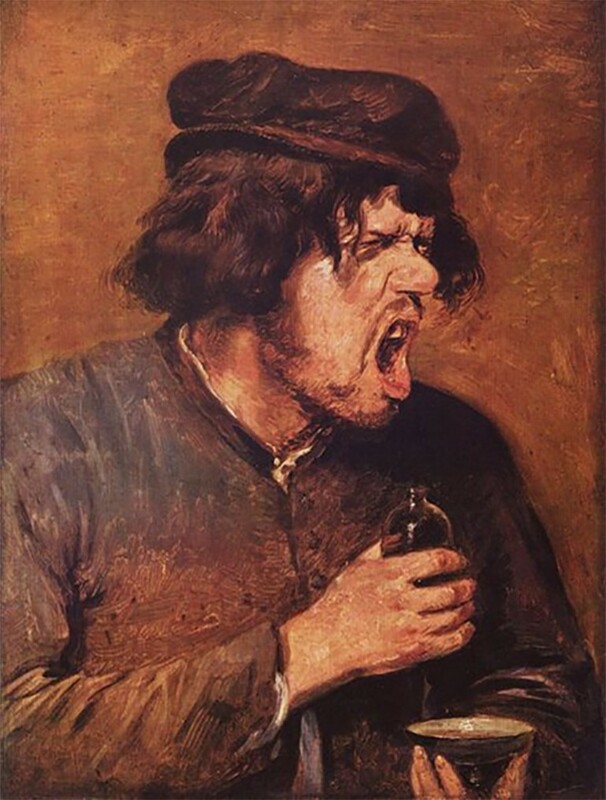 One of the best examples of a human’s response was in his painting called “The Bitter Tonic.” His work was quite popular and there were many forgeries sold during his time. However, it seemed that financial problems were part of his life. He had been living in Antwerp for only a year and he was already deeply indebted, and his entire property was signed over to a friend so that he could escape the ire of creditors. Brouwer also became a political prisoner and was kept at a Spanish castle, purportedly because he approached the building wearing Hollander clothes, and while that seemed like a fabricated lie than the truth, a contemporary writer thought that is was because the artist was suspected of being sympathetic to the plight of Protestants and the Dutch people. Others said that at that time, he was returning to Antwerp after a brief stint in Amsterdam but the Spanish troops arrested him, suspecting Brouwer was a spy for the Netherlands. Peter Paul Rubens provided testimony that Brouwer was a Flanders-born artist who was returning to Antwerp. The very outspoken Brouwer was believed to have led a very bohemian lifestyle, although he preferred to appear shabby in his clothing and in person. However, it could not all be true, because he was taken in as a boarder by the dignified engraver of Rubens, Paulus Pontius. While Brouwer was labeled as a painter prone to depict oddities, he was a very sensitive artist, using his paintings to show what society usually wanted to deny and avoid, yet it could also be a reflection of his personal life – his rebelliousness and refusal to show respect to the political and cultural regime at that time. Brouwer was said to be generous, friendly unpretentious and very witty. He abhorred hypocrisy. And his paintings commanded high prices even back then. He would rather destroy a painting rather than reduce its price. He was proud of his work and had reason to be like that. Rembrandt bought a book of his sketches and eight paintings while Rubens owned 17 paintings of Brouwer’s, a testament to his artistic brilliance. 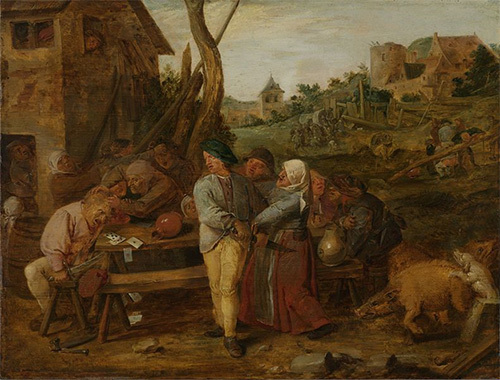 In his early paintings, Brouwer showed the influence of Pieter Bruegel the Elder in his construction and figures with bestial faces and squat proportions. Even at the early stage of his career, he already added various local colors to his themes. He showed people in every day scenes, which could be ugly, yet he played them up to dramatic effect with his use of light and dark, the compact compositions and simple and large figure constructions. His personal life might have been very irregular but his works showed that he studied nonstop, making better use of pigments and colors to greater effect, and has a lighter and swifter brush handling. He painted the lower classes of society the way he saw them – during their petty quarrels, their intoxication, their gambling or their fights at a tavern. Adriaen Brouwer died at the age of 33, and despite his short life was very influential to other masters, including Adriaen van Ostade, Jan Steen and Adriaen van Ostade.